Traditionally, the Daily Trojan endorses a presidential ticket in the Undergraduate Student Government’s elections. This year, however, the editors of the Daily Trojan have opted not to endorse any of the candidates. Though an endorsement is only a recommendation, the hyper-local environment of a university makes an endorsement for student government elections more influential than an endorsement for the United States presidential seat. Relationships among student organizations and among members within those organizations are inevitable. Hence, endorsements can unintentionally exhibit bias because of personal relationships with candidates. The responsibility of this newspaper is to provide objective news coverage. But it is the responsibility of the reader to decide which candidates are best suited to take up the roles of two of the top student leader positions on campus. An endorsement from the Daily Trojan would only undermine students’ abilities to judge for themselves the best candidates to lead the undergraduate student population. 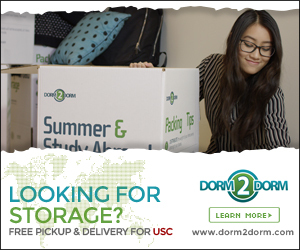 With a print circulation of 10,000, the Daily Trojan is an easily accessible resource for people interested in USC news. And after 100 years as USC’s student newspaper, readers rely on the Daily Trojan to provide fair news coverage. Choosing not to endorse a presidential ticket is an indication on behalf of the editorial board that it has made a conscious effort not to influence voters toward voting for one pair of candidates over another. The editors of the Daily Trojan encourage all undergraduates to research the candidates and cast an informed vote. Voting ends Thursday. To cast a paper ballot, visit booths alongside Trousdale Parkway, or vote online at elections.usc.edu. Staff editorials are determined by the senior editorial board. Its members include Maya Itah, Melissa Caskey, Sean Fitz-Gerald and Giovanni Osorio. What a cowardly way out. I think this is a good idea. The readership of the Daily Trojan is smaller than the LA times, SF Chronicle, NY Times, and therefore the endorsement of a candidate would lead to an unfair election. The Daily Trojan is also the only publication which can endorse a candidate. There are no other student newspapers at USC, so there could be no competition from another candidate through the same means of newspaper media. Students should be able to do their research and vote for the candidate they choose. Notice Daily Trojan didn’t say they wouldn’t provide any candidate coverage, simply that they would not choose a side. This helps the election go more based on campaigns than based on who has friends at the student paper. Plenty of other reputable news sources: LA Times, SF Chronicle, NY Times, WSJ, etc. endorse candidates for different races. It doesn’t mean that those newspapers assume that individuals can’t make the decision to vote for someone because of their own research. As much as I would likely never vote for the candidate the DT endorses because of its liberal slant, its important to hold yourself to the high standard these other major papers do and endorse a candidate. So… The Daily Trojan is saying it’s neither informed nor unbiased enough to lend its opinion on this matter. In the opinion pages. That’s heartening.